KNOXVILLE, Tenn. — Off to its best start since the 2007-08 season, No. 3 Tennessee opens conference play Saturday afternoon against the Georgia Bulldogs in front of a sold-out crowd at Thompson-Boling Arena. The game will tip at 3:30 p.m. ET and will be televised on SEC Network and can also be viewed online through WatchESPN. Fans can listen live on their local Vol Network affiliate to hear Bob Kesling and Bert Bertelkamp describing the action. Tennessee (11-1) picks up the conference slate exactly where it left off. In March, the Vols capped off the regular season with a win over the Bulldogs at home to clinch a share of the SEC regular-season title. Now, UT hopes to win the title in back-to-back years for the first time in program history. Saturday’s matchup will feature a pair of talented forwards clashing in the paint. Grant Williams leads the Vols in scoring (20.1 ppg), rebounding (8.3 rpg) and steals (1.1 spg) while ranking in second in assists (4.0 apg) and blocks (1.8 bpg). Georgia’s Nicolas Claxton (13.3 ppg, 10.2 rpg, 3.1 bpg, 2.5 apg, 1.3 spg) is the reigning SEC Player of the Week after recording his eighth double-digit scoring performance of the season. The sophomore is one of three D-I players–and the only one at a Power 5 school–who leads his team in rebounds, assists, blocks and steals. The anticipation by the fans for this exciting season was felt early on when the Kentucky and West Virginia games sold out shortly after single-game tickets went on sale. Now, all Saturday home games are sold out and limited tickets are left for the remainder of Tennessee’s home slate. Visit AllVols.com soon if you’re interested in buying tickets for one of our remaining conference games. • Tennessee leads the all-time series with Georgia, 95-60, dating to 1913. This is the 156th meeting overall, and the Vols own a 58-15 edge in Knoxville. • The Volunteers have never been ranked higher than No. 3 for a clash vs. UGA. In 2008, the third-ranked Vols defeated the Bulldogs, 85-69. • Last season’s home clash with Georgia was an historic night for the Big Orange, as the Vols clinched a share of the SEC regular-season championship. • Extend Tennessee’s win streak to eight games. • Extend UT’s home win streak to 17 games. It’s the longest such streak of the Barnes era. • Preserve Tennessee’s perfect record this season at Thompson-Boling Arena. • Over their last three games, the Vols are averaging 87.3 points while shooting .583 as a team. • Tennessee is off to its best 12-game start since also starting the season 11-1 in 2007-08. • With an average attendance of 16,976, Tennessee ranks sixth nationally. • Tom Crean has coached against the Vols just once previously while head coach at Marquette. His roster featured a guy named Dwyane Wade. • In four career games vs. Georgia, Jordan Bone (16/2) and Jordan Bowden (12/1) have combined for 28 assists and three turnovers in 210 total minutes played. • Grant Williams averages 15.8 points and 2.0 blocks in his four previous games played against Georgia. • Grant Williams leads the SEC in scoring (20.1 ppg), ranks second in field-goal percentage (.590), fifth in rebounding (8.3 rpg) and seventh in assists (4.0 apg). He also owns the team’s best plus-minus (per 40) rating at +22.96. • Admiral Schofield is the SEC’s second-leading scorer (18.2 ppg). • Jordan Bone has logged 97 minutes over UT’s last three games and has totaled 58 points, 26 assists and only four turnovers while also shooting .595 during that span. • Forwards Kyle Alexander and Grant Williams both grabbed their 500th career rebound in UT’s win over Tennessee Tech last Saturday. • Junior guard Lamonté Turner, last season’s SEC Co-Sixth Man of the Year, remains sidelined with a left shoulder injury and has appeared in only three games this season. • Tennessee owns its best winning-percentage entering SEC play since a 12-1 start to the 2007-08 season, a campaign in which the Vols advanced to the Sweet Sixteen. 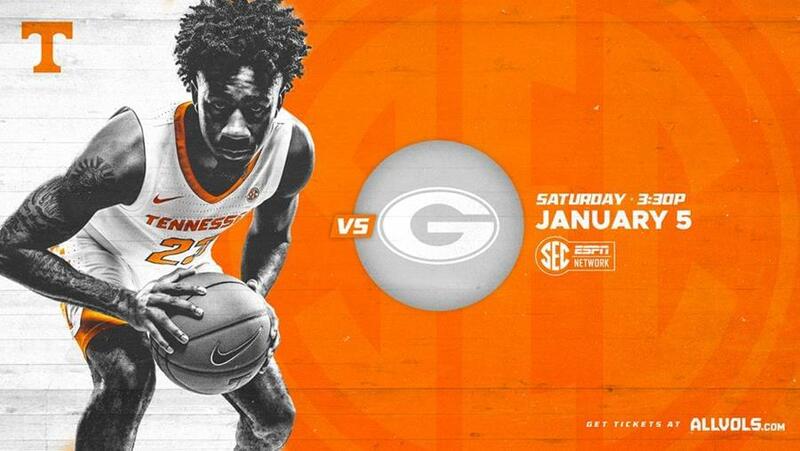 • Not since the 2008-09 season has Tennessee faced Georgia in its SEC opener. The Vols won that game, 86-77, in Athens. • The Volunteers have won 14 of their last 19 SEC openers. The losses came at Arkansas in 2011, vs. Kentucky in 2003, vs. Ole Miss in 2013, at Auburn in 2016 and at Arkansas last season. • Tennessee is 1-2 in SEC openers under Rick Barnes. • During his 17-year head coaching tenure at Texas, Barnes was 13-4 in conference openers, including an 8-3 mark on the road. • The Volunteers 16-15 in SEC home openers at Thompson-Boling Arena. Last season, UT dropped its first home SEC game to Auburn, 94-84, on Jan. 2. • Tennessee scored the game’s final nine points and survived a thrilling battle with Georgia to win a share of the SEC regular-season championship, 66-61, on March 3, 2018. • The SEC title is UT’s first since the 2007-08 season. The Volunteers were picked in the preseason to finish 13th in the 14-team league. 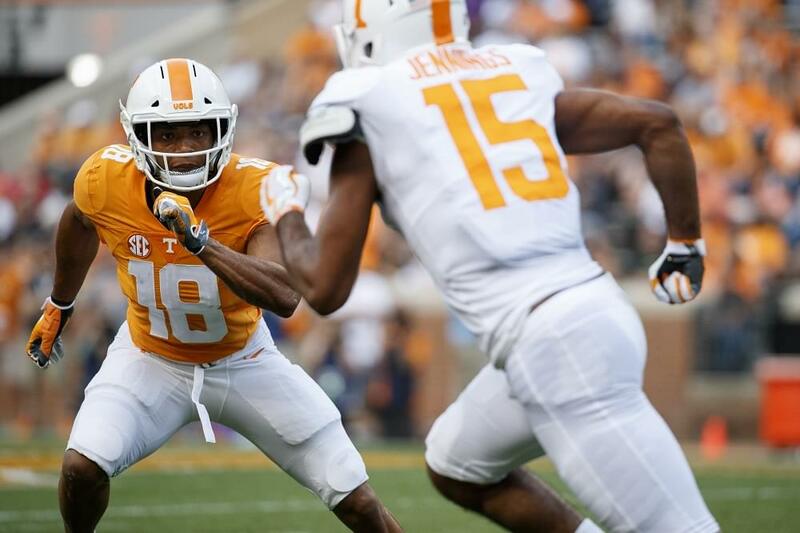 • With Tennessee leading 61-60 with less than a minute remaining, Kyle Alexander stole a Georgia pass to give the Vols possession. On the other end of the court, Admiral Schofield hit a mid-range jumper with 17 seconds left to push the Volunteers’ lead to three points, 64-61. • Following a UGA timeout, Georgia guard William Jackson’s final 3-point attempt with five seconds left fell short. Schofield hit two free throws on the other end to seal the win for the Vols. • The 16th-ranked Vols’ 9-0 run to end the game was sparked by a Lamonté Turner 3-pointer that cut a four-point Tennessee deficit with just over two minutes remaining down to one. • Sophomore Jordan Bowden made two free throws a minute later to give the Vols the lead that they would not relinquish. • Schofield led Tennessee with 23 points. Grant Williams, who fouled out of the game with 3:33 remaining, had 22 points. Schofield and Williams combined for 45 of Tennessee’s 66 points (68 percent). • Senior Yante Maten led Georgia with 18 points, while freshman Rayshaun Hammonds added 12. • Fourth-year UT assistant coach Desmond Oliver was an assistant coach at UGA under Dennis Felton from 2004-09. • During Oliver’s tenure in Athens with Felton—who himself was once an assistant under Rick Barnes at Providence and Clemson from 1992-98—the Bulldogs made consecutive postseason appearances in 2007 (NIT) and 2008 (NCAA Tournament). • Oliver was on UGA’s staff during one of the most memorable conference tourney runs in recent history when Georgia won two games on the same day to capture the 2008 SEC Tournament championship. • Austin “Red” Robbins had what may have been the best performance in UT history at the time with 35 points and 20 rebounds on Feb. 7, 1966, as UT routed Georgia 100-71 at old Armory-Fieldhouse in Knoxville. • Bernard King made 18 field goals at Georgia on Feb. 1, 1975. King had 42 points and 18 rebounds in that 105-69 Vol victory. • Future NBA Lottery Pick Marcus Haislip paced the Vols with 18 points and 11 rebounds, while Vincent Yarbrough added 17 points as UT outscored the 16th-ranked Dawgs 11-3 in overtime to take a 71-63 win in Knoxville on March 2, 2002. • Legendary Tennessee head coach Ray Mears was at his best against Georgia. Mears was 25-4 vs. UGA during his tenure on The Hill (1962-78).